Identification: Trachemys s. elegans (Wied-Neuwied, 1838), the Red-eared Slider, has a unique, broad red or orange (rarely yellow) stripe behind each eye (Ernst et al, 1994; Conant and Collins, 1998). Younger individuals have numerous dark, eyelike spots on the yellow plastron (Conant and Collins, 1998). Trachemys scripta, usually T. s. elegans, is probably the most widely illustrated turtle in the world, appearing in numerous publications (Carr, 1952; Smith, 1961; Ernst and Barbour, 1972, 1989; Mount, 1975; Behler and King, 1979; Pritchard, 1979; Sengoku, 1979; Smith and Smith, 1979; Martof et al., 1980; Caldwell and Collins, 1981; Smith and Brodie, 1982; DeGraaf and Rudis, 1983; Pritchard and Trebbau, 1984; [Mathui], 1985; Stebbins, 1985; Garrett and Barker, 1987; Green and Pauley, 1987; Alderton, 1988; Christiansen and Bailey, 1988; [Sievert] and Sievert, ; Dundee and Rossman, 1989; Harding and Holman, 1990; Ashton and Ashton, 1991; Carmichael and Williams, 1991; Leviton et al., 1992; Collins, 1993; Collins and Collins, 1993; Ernst et al., 1994; Mitchell, 1994; Brown et al., 1995; Palmer and Braswell, 1995; Degenhardt et al., 1996; McKeown, 1996; Harding, 1997; Lamar, 1997; Branch, 1998; Campbell, 1998; Conant and Collins, 1998; Cox et al., 1998; Powell et al., 1998; Bartlett and Bartlett, 1999a, b; Behler, 1999; Phillips et al., 1999; Johnson, 2000; Minton, 2001). Native Range: The Red-eared Slider's indigenous range broadly covers the midwestern states and extending as far east as West Virginia and a disjunct (relict) population in southern Ohio, as far west as eastern New Mexico, and as far south as south of the Rio Grande River into northeastern Mexico (Smith, 1961; Webb, 1970; Smith and Smith, 1973, 1976, 1979, 1993; Green and Pauley, 1978; Caldwell and Collins, 1981; Lohoefener and Altig, 1983; Garrett and Barker, 1987; Christiansen and Bailey, 1988; Carpenter and Krupa, 1989; Dundee and Rossman, 1989; Collins and Collins, 1993; Flores-Villela, 1993; Degenhardt et al., 1996; Conant and Collins, 1998; Ballinger and Lynch, 1999; Bartlett and Bartlett, 1999b; Phillips et al., 1999; Auth et al., 2000; Dixon, 2000; Johnson, 2000; Stuart, 2000; Minton, 2001). Table 1. States with nonindigenous occurrences, the earliest and latest observations in each state, and the tally and names of HUCs with observations†. Names and dates are hyperlinked to their relevant specimen records. The list of references for all nonindigenous occurrences of Trachemys scripta elegans are found here. Ecology: Pond sliders are aquatic, omnivorous generalists, which rarely leave water except to bask (Ernst et al., 1994; Brown et al., 1995; Conant and Collins, 1998; Cox et al., 1998). Adult turtles tend to be more herbivorous than juveniles, but both will opportunistically eat aquatic invertebrates (especially insects and mollusks), fish, frog eggs and tadpoles, aquatic snakes, and a wide variety of aquatic plants and algae (Ernst et al., 1994; Brown et al., 1995). Although they prefer quiet waters, T. elegans is highly adaptable and can tolerate anything from brackish waters, to manmade canals, and city park ponds (Ernst et al., 1994; Cox et al., 1998; Salzberg, 2000). The Red-eared Slider may wander far from water, and rapidly colonize any newly available habitat (Cox et al., 1998; Minton, 2001). In California, this ability to rapidly colonize available habitat may be aided by an extensive system of manmade canals and irrigation ditches. Females lay 2-23 eggs per clutch in a cavity dug out of the soil, and as many as five clutches may be oviposited per year (Gibbons, 1990; Ernst et al., 1994). Means of Introduction: Throughout its nonindigenous range T. scripta is introduced primarily through pet releases and escapes; a situation which has continued for several decades since the 1930s, reaching a peak during the Teenage Mutant Ninja Turtle television cartoon craze of the late 1980s-early 1990s (Ernst et al., 1994; Mitchell, 1994; Brown et al., 1995; Frank and McCoy, 1995; Lamar, 1997; Branch, 1998; Cox et al., 1998; Albright, 1999; Bartlett and Bartlett, 1999a; Ota, 1999; Williams, 1999; Beebee and Griffiths, 2000; Salzberg, 2000; Thomas and Hartnell, 2000; Minton, 2001; Porras, 2002). Additionally, most species of turtles are subject to intense commercial trade in the Asian food market (Williams, 1999); therefore, the transport and potential release of T. scripta for food and aquaculture in Asia and U.S. Pacific states with proportionally large Asian populations cannot be ruled out. Stebbins (1985) claims that pond sliders may have been introduced to Baja California, Mexico, for food; but his identity of this species as T. scripta is uncertain. As recently as 2001, a Dutch animal welfare group attempted to ship unwanted pet T. s. elegans to Italy for eventual nonindigenous release into the wild (M. Hoogmoed and J. Perala as communicated to K. Dodd, personal communication 2001). Status: In nearly all of its nonindigenous localities in Canada, New York, New Jersey, Pennsylvania, Michigan, Virginia, North Carolina, South Carolina, and perhaps Massachusetts, isolated populations of T. s. elegans are reproducing and thriving (Stein et al., 1980; Manchester, 1982; DeGraaf and Rudis, 1983; Harding and Holman, 1990; Cardoza et al., 1993; Ernst et al., 1994; Mitchell, 1994; D'Alessandro and Ernst, 1995; Palmer and Braswell, 1995; Platt and Snyder, 1996; Harding, 1997; Salzberg, 2000; Breisch et al., 2001; R. Burke, personal communication 1997; A. Hulse, personal communication 1997); although Klemens (1993) questions whether T. s. elegans eggs can hatch at colder latitudes in Connecticut. Klemens (1993) may be unaware of breeding populations found in Ontario, Canada, and Michigan; therefore; his doubts probably have no basis in fact. In the state of New York, T. s. elegans seem to be invasive, particularly on Long Island; however, it is unclear if related T. s. scripta, a race that prefers a warmer climate, can reproduce or even survive long at this latitude. Nonindigenous Yellow-bellied Sliders are established in Fairfax County, northern Virginia (Ernst et al., 1997). The Red-eared Sliders found in Cumberland and Kennebec Counties, Maine, are surviving through the winter months, but it is not known if they are reproducing (Albright, 1999). In Maryland, Red-eared Sliders are well established and invasive in a broad region throughout much of the northern and central portions of the state (Harris, 1975; Conant and Collins, 1998). In Florida, most small populations of T. s. elegans are established in limited, small colonies (Moler, 1988; Ashton and Ashton, 1991; Bartlett, 1994; Dalrymple, 1994; Butterfield et al., 1997; Bartlett and Bartlett, 1999a; King, 2000; Townsend et al., 2002), except for those discovered in the Keys where there is yet no evidence of reproductive colonies (Butterfield et al., 1994; Duquesnel, 1996). A forthcoming assessment of the status of nonindigenous pond sliders in Florida will be made by Meshaka et al. (2003). There is no evidence for an established population of nonindigenous T. s. elegans in Wisconsin (Cochran et al., 1987). The current populations of T. s. elegans in Marion County, Indiana, are established and spreading, yet it is not clear if they represent an indigenous migration or nonindigenous introduction (Minton, 2001). In Nebraska, there do not seem to be any current, established, nonindigenous T. s. elegans, and the only indigenous population occurs in Richardson County in the extreme southeast corner of the state (Ballinger and Lynch, 1999). All Red-eared Sliders found in Colorado seem to be waifs from pet releases (Livo et al., 1998); therefore, this species is not listed by Hammerson (1999) as being part of Colorado's herpetofauna. Nonindigenous populations of T. s. elegans in western Texas, New Mexico, and Arizona seem to be established (Hulse, 1980; Stebbins, 1985; Jones, 1988; Stuart, 1995a, 2000; Degenhardt et al., 1996; Howland, 1996; Dixon, 2000; M. Demlong, personal communication 1997), and the populations in the Rio Grande drainage in New Mexico are probably invasive. The T. s. scripta found in Arizona and the Rio Grande drainage of New Mexico do not yet represent established populations (Hulse, 1980; Stuart, 1995b, 2000; Degenhardt et al., 1996), but future surveys are required to establish this. In the Pacific states of California, Oregon, and Washington, T. s. elegans is well established in numerous localities (Brown et al., 1995; Williams, 1999; Dvornich et al., 2001; D. Holland, personal communication 1997; L. Overtree, personal communication 1997; H. B. Schaffer, personal communication 2000; J. Abel, personal communication 2001). The records provided in this review may greatly underestimate the distribution of T. scripta in these states. In Hawaii, Guam, and the Northern Mariana Islands, T. s. elegans is established but impacts are unclear (McCoid, 1993; Ernst et al., 1994; McCoid and Kleberg, 1995; McKeown, 1996). Red-eared Sliders are well established on Guadeloupe, Lesser Antilles (Schwartz and Henderson, 1985, 1991; Censky and Kaiser, 1999). In most cases, T. s. elegans seem to be established in its various non-U.S., worldwide localities mentioned above (Ernst et al., 1994; Lamar, 1997; Cox et al., 1998; Salzberg, 2000; Minton, 2001), except perhaps, New Zealand (Thomas and Hartnell, 2000). However, Beebee and Griffiths (2000) do not believe summers in the United Kingdom are long enough or warm enough for successful incubation of T. s. elegans eggs. In various parts of Southeast Asia, Red-eared Sliders are present (Cox et al., 1998). Impact of Introduction: Despite the vast worldwide occurrence of T. scripta, particularly T. s. elegans, little is known of it impact on indigenous ecosystems. In some countries, Red-eared Sliders compete with indigenous species for food and basking sites (Frank and McCoy, 1995; Williams, 1999; Salzberg, 2000). In the U.S. state of Washington, they are a potential threat to Clemmys marmorata, the Pacific pond turtle (Williams, 1999), a declining species endemic to the Pacific states (Brown et al., 1995). 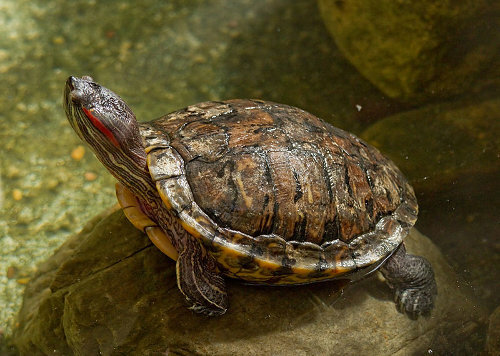 Red-eared Sliders seem to be adaptable to many climates. This combined with their omnivorous diet and ability to adapt to various habitats, gives them great potential for impacting indigenous habitats should reproducing populations become established. The spread of T. s. elegans throughout the Pacific states in the U.S. is ominous and requires further monitoring. The spread of Red-eared Sliders in southern U.S. states, where the closely related Yellow-bellied Slider is indigenous, has the potential for T. s. elegans to compete with T. s. scripta. Additionally, interbreeding between the two races has occurred in various southern states (Ernst et al., 1994; Mitchell, 1994; Palmer and Braswell, 1995; Williams, 1999), which compromises the genetic integrity of indigenous Yellow-bellied Sliders. In New Mexico, T. s. elegans can cause a similar problem by hybridizing with Trachemys gaigae (Seidel et al., 1999; Stuart, 2000). Aquaculture of Red-eared Sliders for the pet trade are often associated with the threat of salmonellosis in children who receive them as pets (Williams, 1999), but it could negatively impact indigenous wild turtles when released pets spread diseases and parasites into the environment (Stuart, 2000). Remarks: The most current taxonomic reviews or summaries of pond sliders are by Seidel (1988, 2002), Seidel et al. (1999), and Iverson et al. (2000). Liner (1994) provides a list of regional vernacular names for T. scripta. The best summaries or literature reviews of the natural history of T. scripta are by Gibbons and Semlitsch (1991), Ernst et al. (1994), and various studies compiled by Gibbons (1990). Scientific and standard English names follow Crother (2008). Pond sliders are commercially raised in incredibly large numbers for the pet trade throughout the southeastern U.S., especially Louisiana (Ernst et al., 1994; Williams, 1999; Salzberg, 2000). The sale of all turtles under the size of "4 inches" (about 100 mm) or viable eggs was banned in the United States, except for educational or research purposes, by the U.S. Food and Drug Administration in 1975 to prevent the spread of salmonellosis in children (Ernst et al., 1994; Level, 1997; Williams, 1999). Four inches or less is thought to be the size that a child can easily stuff into his mouth (Williams, 1999). The extensive use of antibiotics at turtle hatcheries in the U.S. has given rise to more antibiotic-resistant strains of Salmonella (Ernst et al., 1994). In many U.S. states T. s. elegans is the subject of specific regulation (Level, 1997). Nevertheless, undersized juvenile T. scripta are still commonly sold in pet stores in Florida, and as recently as 2002 they were sold by roadside venders at a busy intersection in Gainesville, Florida (Somma, personal observation). The European Union has banned the import of T. s. elegans because of the negative impact that released pets can have on native European pond turtles (Emys orbicularis species complex) (Williams, 1999). Abel, J. 2001. Personal communication—Resident, Palo Alto, California. Albright, J. 1999. Hypotheticals, accidentals, and other oddities. Pp. 197-200. In: M. L. Hunter, A. J. K. Calhoun, and M. McCollough (editors). Maine Amphibians and Reptiles. The University of Maine Press, Orono, Maine. 254 pp. + CD. Alderton, D. 1988. Turtles & Tortoises of the World. Facts on File, Inc., New York. 191 pp. Auth, D. L., H. M. Smith, B. C. Brown, and D. Lintz. 2000. A description of the Mexican amphibian and reptile collection of the Strecker Museum. Bulletin of the Chicago Herpetological Society 35(4):65-85. Ballinger, R. E., and J. D. Lynch. 1999. Geographic distribution: Trachemys scripta elegans (red-eared slider). USA: Nebraska: Richardson Co. Herpetological Review 30(2):108-109. Bartlett, R. D. 1994. Florida's alien herps. Reptile & Amphibian Magazine (27):56-73, 103-109. Beebee, T. J. C., and R. A. Griffiths. 2000. Amphibians and Reptiles. A Natural History of the British Herpetofauna. HarperCollins Publishers, London. 270 pp. Beltz, E. 1997. HerPet-POURRI. Quite a range extension. Bulletin of the Chicago Herpetological Society 32(6):140. Beltz, E. 2002. HerPET-POURRI. World traveled turtles. Bulletin of the Chicago Herpetological Society 37(6):112. Branch, B. [=W. R.] 1998. Field Guide to Snakes and Other Reptiles of Southern Africa. Third Revised Edition. Ralph Curtis Books Publishing, Sanibel Island, Florida. 399 pp. Breisch, A. R., J. W. Ozard, and 1425 Atlas Contributors. 2001. New York State Amphibian and Reptile Atlas Project [online]. Available on URL: http://www.dec.state.ny.us/website/dfwmr/wildlife/herp/turtles.html. New York State Department of Environmental Conservation, Division of Fish, Wildlife and Marine Resources, New York. Brown, H. A., R. B. Bury, D. M. Darda, L. V. Diller, C. R. Peterson, and R. M. Storm. 1995. Reptiles of Washington and Oregon. Seattle Audubon Society, Seattle. 176 pp. Burke, R. L. 1997. Personal communication—Zoologist/Professor, Department of Biology, Hofstra University, Hempstead, New York 11549. Bury, R. B., and R. A. Luckenbach. 1976. Introduced amphibians and reptiles in California. Biological Conservation 1976(10):1-14. Butterfield, B. P., W. E. Meshaka, Jr., and J. B. Hauge. 1994. Two turtles new to the Florida Keys. Herpetological Review 25(2):81. Caldwell, J. P., and J. T. Collins. 1981. Turtles in Kansas. AMS Publishing, Lawrence, Kansas. 67 pp. Campbell, J. A. 1998. Amphibians and Reptiles of Northern Guatemala, the Yucatán, and Belize. University of Oklahoma Press, Norman, Oklahoma. 380 pp. Censky, E. J., and H. Kaiser. 1999. The Lesser Antillean fauna. Pp. 181-221. In: B. I. Crother (editor). Caribbean Amphibians and Reptiles. Academic Press, San Diego. 495 pp. Christiansen, J. L., and R. M. Bailey. 1988. The lizards and turtles of Iowa. Iowa Department of Natural Resources Technical Series (3):1-19. Cochran, P. A., J. B. Hodgson, and R. M. Korb. 1987. New distributional records for reptiles and amphibians in Brown County, Wisconsin. Herpetological Review 18(1):21-23. Collins, J. T., and S. L. Collins. 1993. Reptiles and Amphibians of the Cheyenne Bottoms. Hearth Publishing, Hillsboro, Kansas. 92 pp. Cooper, J. E. 1959. The turtle Pseudemys scripta feral in Maryland. Herpetologica 15(1):44. Cox, M. J., P. P. van Dijk, J. Nabhitabhata, and K. Thirakhupt. 1998. A Photographic Guide to Snakes and Other Reptiles of Peninsular Malaysia, Singapore and Thailand. New Holland Publishers (UK) Ltd, London. 144 pp. D'Alessandro, S. E., and C. H. Ernst. 1995. Additional geographic records for reptiles in Virginia. Herpetological Review 26(4):212-214. Dalrymple, G. H. 1994. Non-indigenous amphibians and reptiles in Florida. Pp. 67-78. In: D. C. Schmitz and T. C. Brown (editors). An Assessment of Invasive Non-indigenous Species in Florida's Public Lands. Division of Environmental Resource Permitting, Florida Department of Environmental Protection, Technical Report No. TSS-94-100, Tallahassee. 303 pp. Degenhardt, W. G., and J. L. Christiansen. 1974. Distribution and habitats of turtles in New Mexico. The Southwestern Naturalist 19(1):21-46. Degenhardt, W. G., C. W. Painter, and A. H. Price. 1996. Amphibians and Reptiles of New Mexico. University of New Mexico Press, Albuquerque. 419 pp. DeGraaf, R. M., and D. D. Rudis. 1983. Amphibians and Reptiles of New England. Habitats and Natural History. The University of Massachusetts Press, Amherst. 85 pp. Demlong, M. 1997. Personal communication—Herpetologist, Phoenix Zoo, 455 N. Galvin Parkway, Phoenix, Arizona. Dodd, K. 2001. Personal communication—Herpetologist, Florida Caribbean Science Center, Biological Resources Division, United States Geological Survey, 7920 NW 71st Street, Gainesville, Florida 32653. Duquesnel, J. 1996. Scaly Visitors. Resource Management Notes (Florida Department of Environmental Protection, Tallahassee) 8(2):40. Dvornich, K., and contributors. 2001. NatureMapping wildlife observations with the Washington Gap Analysis Project's predicted distributions. In: The NatureMapping Program in Washington [online]. Available on URL: http://www.fish.washington.edu/naturemapping/. University of Washington, Seattle. Edgren, R. A., Jr. 1943. Pseudemys scripta troostii in Michigan. Copeia 1943(4):249. Edgren, R. A., Jr. 1948. Some additional notes on Michigan Pseudemys. Natural History Miscellanea (Chicago) (22):1-2. Flores-Villela, O. 1993. Herpetofauna Mexicana. Carnegie Museum of Natural History Special Publication (17):i-iv, 1-73. Frank, J. H., and E. D. McCoy. 1995. Introduction to insect behavioral ecology: The good, the bad, and the beautiful: Non-indigenous species in Florida. Invasive adventive insects and other organisms in Florida. Florida Entomologist 78(1):1-15. Gibbons, J. W. (editor). 1990. Life History and Ecology of the Slider Turtle. Smithsonian Institution Press, Washington, D.C. and London. 368 pp. Gordon, H., and J. A. Fowler. 1961. A new locality record for Pseudemys scripta elegans in Michigan. Copeia 1961(3):350. Green, N. B., and T. K. Pauley. 1987. Amphibians and Reptiles in West Virginia. University of Pittsburgh Press, Pittsburgh. 241 pp. Hammerson, G. A. 1999. Amphibians and Reptiles in Colorado. Second Edition. University Press of Colorado, Niwot, Colorado. 484 pp. Harding, J. H., and J. A. Holman. 1990. Michigan Turtles and Lizards. Department of Outreach Communications, Michigan State University, East Lansing. 94 pp. Harding, J. H. 1997. Amphibians and Reptiles of the Great Lakes Region. The University of Michigan Press, Ann Arbor. 378 pp. Howland, J. M. 1996. Herps of Arizona. The Desert Monitor (Phoenix) 27(1):12-17. Hulse, A. C. 1980. Notes on the occurrence of introduced turtles in Arizona. Herpetological Review 11(1):16-17. Hulse, A. S. 1997. Personal communication—Herpetologist/Professor, Indiana University of Pennsylvania, Indiana, Pennsylvania. Jones, B. K. 1988. Distribution and habitat associations of herpetofauna in Arizona: Comparisons by habitat type. Pp. 109-128. In: R. C. Szaro, K. E. Severson, and D. R. Patton (coordinators). Management of Amphibians, Reptiles, and Small Mammals in North America. Proceedings of the Symposium. July 19-21, 1988, Flagstaff, Arizona. United States Department of Agriculture Forest Service, General Technical Report RM-166, Fort Collins. 458 pp. King, F. W., and R. L. Burke (editors). 1989. Crocodilian, Tuatara, and Turtle Species of the World. A Taxonomic and Geographic Reference. The Association of Systematics Collections, Washington, DC. 216 pp. Klemens, M. W. 1993. Amphibians and reptiles of Connecticut and adjacent regions. State Geological and Natural History Survey of Connecticut Bulletin (112):i-xii, 1-318. Level, J. P. 1997. A Field Guide to Reptiles and the Law. Second Revised Edition. Serpent's Tale Natural History Book Distributors, Lanesboro, Minnesota. 270 pp. Leviton, A. E., S. C. Anderson, K. Adler, and S. A. Minton, [Jr.] 1992. Handbook to Middle East Amphibians and Reptiles. Contributions to Herpetology 8. Society for the Study of Amphibians and Reptiles, Oxford, Ohio. 252 pp. Livo, L. J., G. A. Hammerson, and H. M. Smith. 1998. Summary of amphibians and reptiles introduced into Colorado. Northwestern Naturalist 79(1):1-11. [Lue Guangyang, Du Mingzhang, and Xiang Gaoshi. 1999. Taiwan Liang Qi Pa Xing Doang Wu Tu Jian. Chu Ban. Zhonghua Min Guo Zi Ran Sheng Tai Bao Yu Xie Hui, Da Zi Ran Za Zhi She, Taibei. (A Pictorial Guide to the Amphibians and Reptiles of Taiwan. Chu Ban. ROC & Great Nature Press, Taipei.) In Chinese]. 343 pp. Lynch, J. D. 1985. Annotated checklist of the amphibians and reptiles of Nebraska. Transactions of the Nebraska Academy of Sciences 23:33-57. Manchester, D., Sr. 1982. Red-eared sliders in Pennsylvania. Testudo 2(1):27-30. [Mathui, K.] 1985. [Amphibians and Reptiles of Japan. Shôgakûkau, Tokyo.] [In Japanese.] 160 pp. McCann, J. A., L. N. Arkin, and J. D. Williams. 1996. Nonindigenous Aquatic and Selected Terrestrial Species in Florida. Status, Pathways, Dates of Introduction, Range Distributions, and Significant Ecological and Economic Effects. Florida Caribbean Science Center, U. S. Geological Survey, Gainesville. 301 pp. McCoid, M. J. 1993. The "new" Herpetofauna of Guam, Mariana Islands. Herpetological Review 24(1):16-17. McCoid, M. J., and C. Kleberg. 1995. Non-native reptiles and amphibians. Pp. 433-437. In: E. T. LaRoe, G. S. Farris, C. E. Puckett, P. D. Doran, and M. J. Mac (editors). Our Living Resources: A Report to the Nation on the Distribution, Abundance, and Health of U. S. Ecosystems. U.S. Department of the Interior, National Biological Service, Washington, D. C. 530 pp. McKeown, S. 1996. A Field Guide to Reptiles and Amphibians in the Hawaiian Islands. Diamond Head Publishing, Inc., Los Osos, California. 172 pp. Meshaka, W. E., Jr., B. P. Butterfield, and J. B. Hauge. 2003 (in press). The Exotic Amphibians and Reptiles of Florida. Krieger Publishing Company, Malabar, Florida. Murphy, J. C. 1997. Amphibians and Reptiles of Trinidad and Tobago. Krieger Publishing Company, Malabar, Florida. 245 pp. Ota, H. 1999. Introduced amphibians and reptiles of the Ryukyu Archipelago, Japan. Pp. 439-452. In: G. H. Rodda, Y. Sawai, D. Chiszar, and H. Tanaka (editors). Problem Snake Management: The Habu and the Brown Treesnake. Cornell University Press, Ithaca. 534 pp. Overtree, L. 1997. Personal communication—Biologist, South Fork Kern River Valley research, California. Platt, S. G., and W. E. Snyder. 1996. Geographic distribution: Trachemys scripta elegans (red-eared slider). USA: South Carolina: Pickens Co. Herpetological Review 27(3):151. Porras, L. W. 2002. Meet the locals: Your guide to backyard herping. Part four: The East. Reptiles 10(9):92-99. Pritchard, P. C. H., and P. Trebbau. 1984. The Turtles of Venezuela. Contributions to Herpetology 2. Society for the Study of Amphibians and Reptiles, Ithaca. 403 pp., 47 plates, 16 maps. Salzberg, A. 2000. The cage papers. The Norway rat of the turtle world. Reptile & Amphibian Hobbyist 5(8):84. Schaffer, H. B. 2000. Personal communication—Herpetologist, Section of Evolution and Ecology, University of California, Davis, California 95616. Seidel, M. E. 1988. Revision of the West Indian emydid turtles (Testudines). American Museum Novitates (2918):1-41. Seidel, M. E. 2002. Taxonomic observations on extant species and subspecies of slider turtles, genus Trachemys. Journal of Herpetology 36(2):285-292. Seidel, M. E., J. N. Stuart, and W. G. Degenhardt. 1999. Variation and species status of slider turtles (Emydidae: Trachemys) in the southwestern United States and adjacent Mexico. Herpetologica 55(4):470-487. Sengoku, S. 1979. [Amphibians and Reptiles. Ienohikari (House of Light) Corporation, Tokyo. In Japanese.] 206 pp. Smith, H. M., and R. B. Smith. 1973. Synopsis of the Herpetofauna of Mexico. Volume II. Analysis of the Literature Exclusive of the Mexican Axolotl. John Johnson Natural History Books, North Bennington, Vermont. 367 pp. Smith, H. M., and R. B. Smith. 1979. Synopsis of the Herpetofauna of Mexico. Volume VI. Guide to Mexican Turtles. Bibliographic Addendum III. 1044 pp. Solis, F. 2001. Personal communication—Biologist, Fish and Wildlife Service, 3600 E. Paisano, Building A, Room 142, El Paso, Texas 79905. Stebbins, R. C. 1972. California Amphibians and Reptiles. University of California Press, Berkeley, Los Angeles, and London. 152 pp. Stebbins, R. C. 1985. A Field Guide to Western Reptiles and Amphibians. Second Edition. Houghton Mifflin Company, Boston. 336 pp. Stein, R. J., W. K. Eames, and D. C. Parris. 1980. Geographic distribution: Chrysemys scripta elegans (red-eared slider). USA: New Jersey: Mercer Co. Herpetological Review 11(4):115. Stuart, J. N. 1995a. Notes on the aquatic turtles of the Rio Grande drainage, New Mexico. Bulletin of the Maryland Herpetological Society 31(3):147-157. Stuart, J. N. 1995b. Geographic distribution: Trachemys scripta scripta (yellowbelly slider). USA: New Mexico: Socorro Co. Herpetological Review 26(2):107. Stuart, J. N. 2000. Additional notes on native and non-native turtles of the Rio Grande Drainage Basin, New Mexico. Bulletin of the Chicago Herpetological Society 35(10):229-235. Thomas, M., and P. Hartnell. 2000. An occurrence of a red-eared turtle (Trachemys scripta elegans) in the Waikato River at Hamilton, New Zealand. Herpetofauna (Sydney) 30(2):15-17. Townsend, J. H., K. L. Krysko, A. T. Reppas, and C. M. Sheehy III. 2002. Noteworthy new records for introduced reptiles and amphibians from Florida, USA. Herpetological Review 33(1):75. Williams, T. 1999. The terrible turtle trade. Audubon 101(2):44, 46-48, 50-51. Author: Somma, L.A., Foster, A., and Fuller, P.